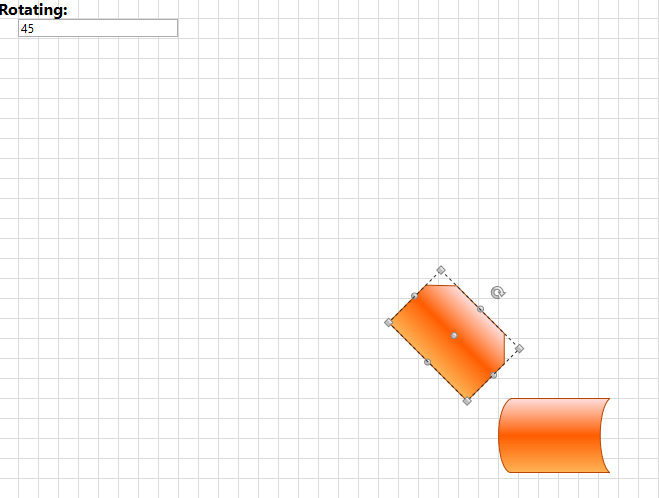 In RadDiagram each RadDiagramItem can be rotated. This operation is implemented by a RotationService. In order to learn more about the different Diagramming Services, you can examine the Services article. In this tutorial we will examine a solution that takes a user-defined value and uses it to define the step of a rotation operation in a RadDiagram instance. First, let's create a sample RadDiagram definition that has two RadDiagramShape objects. Please note that in the RadDiagram definition, the SnapToGrid feature is disabled. If you enable it, you don't have to create a new RotationService to customize the rotation step. Instead you can take advantage of the RotationAngleSnap constant. It allows you to set the snapping angle when rotating items in a grid-snapping enabled RadDiagram. The default value of this constant is 5 degrees. And it can be easily changed by setting DiagramConstants.RotationAngleSnap = 55, but you will have to add a using statement for the Telerik.Windows.Diagrams.Core namespace. Now that our view is ready, we can configure the default rotation mechanism to take into account the rotation step defined by a user. In order to do so, we will have to create a custom RotationService and use it within our diagramming instance. If you run the solution now, the rotationStep will display a value of 45. This is why you will be able to rotate the RadDiagramShapes with 45° on every step. 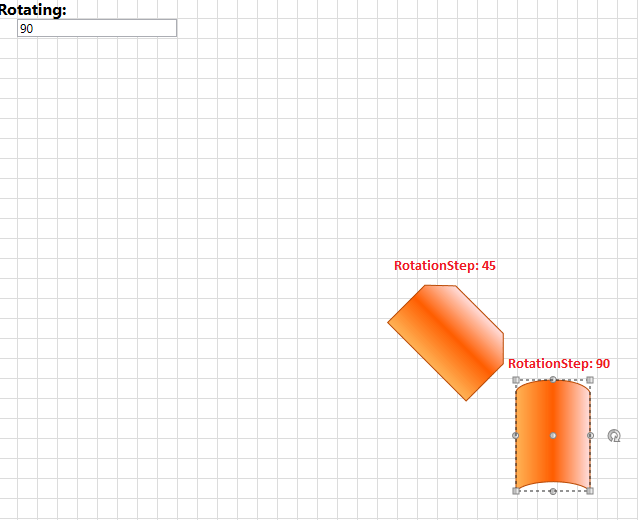 And if you enter a RotationStep of 90, you will be able to rotate the RadDiagramShapes with 90° on every step. You can download a runnable project of the demonstrated example from our online SDK repository here, after navigating to Diagram/CustomServices.